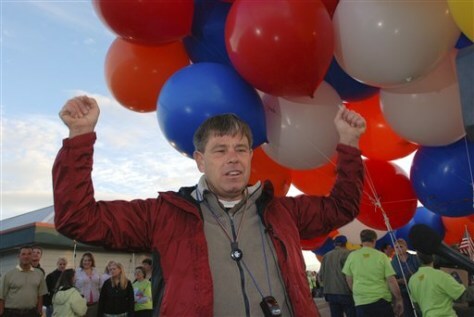 Kent Couch describes the joy of his childhood fantasy of being able to fly by grabbing clusters of helium balloons prior to taking flight, in Bend, Ore., on July 5, 2008. Couch now is planning another cluster balloon adventure, in Baghdad. Couch told KTVZ he was invited by Iraqi daredevil Fareed Lafta who wants to lift off with him Nov. 15 at a Talent for Youth Conference in the Green Zone.